The astronomers have discovered dense gas being blasted out of a compact galaxy (called SDSS J0905+57) at speeds of up to two million miles per hour. The gas is being driven to distances of tens of thousands of light years by the intense pressure exerted on it by the radiation of stars that are forming rapidly at the galaxy's centre. This is having a major impact on the evolution of the galaxy. The team used the Institut de Radioastronomie Millimétrique (IRAM) Plateau de Bure Interferometer, a radio telescope based in the French Alps. By detecting the molecule carbon monoxide, they were able to infer the amount of hydrogen gas present. 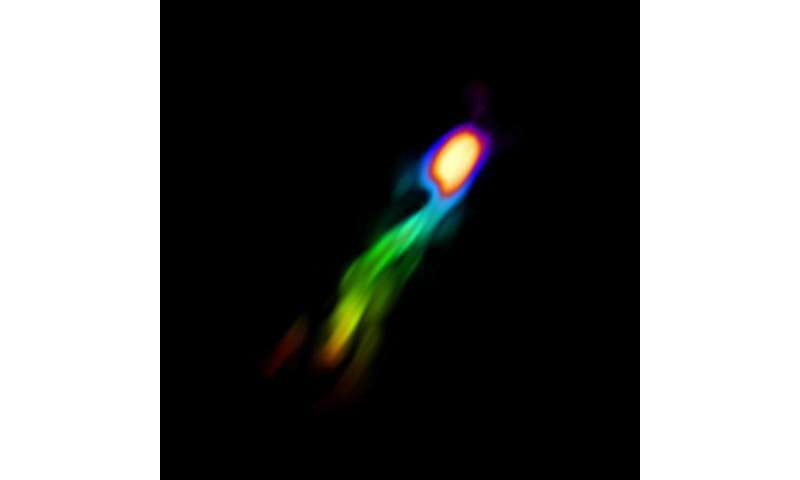 Stars are born from clouds of hydrogen, so by removing this gas the galaxy can rapidly shut down its star formation. There is enough gas in the outflowing material to form the equivalent of over a billion Suns. Dr Geach, who is funded by the Royal Society, explained: "This discovery highlights the serendipity of scientific research. Originally we were simply trying to measure the amount of dense gas in SDSS J0905+57. What we found was something surprising – a large fraction of the gas is being blasted out of the galaxy by the concentration of stars forming at the galaxy's centre. "We are witnessing the aggressive termination of star formation, and the mechanism by which this is happening is an important new clue in our understanding of the evolution of galaxies." Outflows of warm, ionized gas from galaxies are well known, but the team's observation of large amounts of cold, dense gas being violently removed from the central regions of the galaxy and far into space is a new discovery. Previously it was not known whether the stars alone could drive out gas in this way. Instead, it was thought that energy associated with a growing central black hole would be required, but this is known not to be happening in SDSS J0905+57. This result provides important new insights into how the growth of stars is regulated in galaxies. I suspect that the magnetic field required to retain this gas as it reduces to a bh has failed, suffered a 'blow out' and had there been even higher pressure inside the magnetic field, it would have been a nova instead of just a blow out. The article ends by stating this cannot be happening but not why.